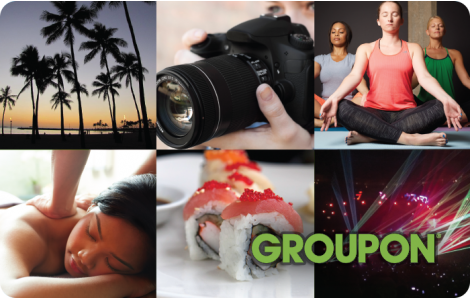 Groupon is a global leader of local commerce and the place you start when you want to buy just about anything, anytime, anywhere. Shoppers discover the best a city has to offer on the web or on mobile with Groupon Local, enjoy vacations with Groupon Getaways, and find a curated selection of electronics, fashion, home furnishings and more with Groupon Goods. National Gift Card is the best place for you to order Groupon gift cards in bulk. We are the experts in all things gift cards and can set up your gift card solutions program for you today. Please contact us for more information on Groupon bulk, direct-to-recipient, or individual gift card fulfillment for your gift card program. Contact us here or call us at 888-472-8747 today! Redeemable only at groupon.com for Groupons or for account credits usable to buy Groupons. Not usable to buy Groupon gift cards. To redeem you must have or create an account at groupon.com. When redeemed, you must use the entire card balance to acquire Groupons, account credits or both. If partially used to buy Groupons, the card balance will be redeemed for credits in your account. Account credits will be administered per your account agreement. Not redeemable for cash unless required by law. Not a credit or debit card. Unauthorized use, reproduction or resale is prohibited. Not reloadable. Safeguard the card. It will not be replaced or replenished if lost, stolen or used without authorization. CARDCO CX, Inc. is the card issuer and sole obligor to card owner. Card is distributed by Groupon, Inc. However, Groupon, Inc. is not obligor to owner. CARDCO may delegate its issuer obligations to an assignee, without recourse. If delegated, the assignee, and not CARDCO, will be sole obligor to card owner. Purchase, use or acceptance of card constitutes acceptance of these terms. Balance Inquiry/Customer Support: support@groupon.com or 1-877-788-7858.